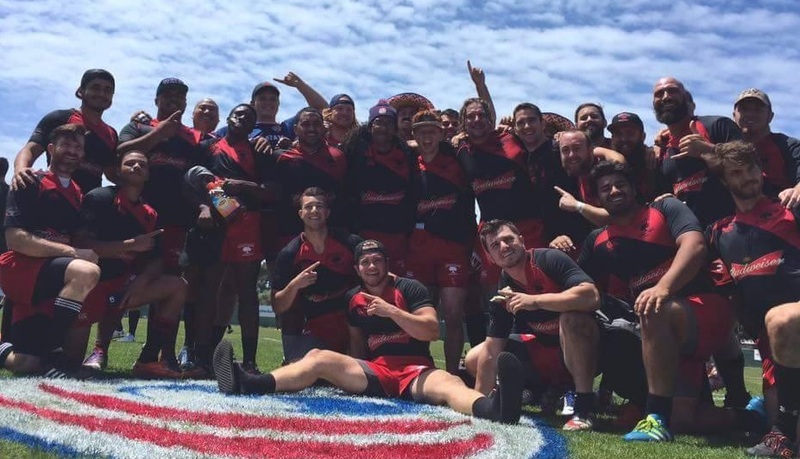 This past Saturday, the Chico Men’s Rugby Club (9-0) took on the Eugen Oregon Stags (9-0) in the Sweet Sixteens of the USA Rugby National Playoffs down in Treasure Island. Both teams showed up with impressive undefeated records, with playoffs on the line it’s win or go home. The match kicked off at noon with Chico having the advantage of a home crowd behind them but the Stags came out running and hitting hard. They got on the board first with a successful penalty kick for three points around the 10 minute mark. Chico controlled the match and continued attacking in the Stags territory for most of the first half, but kept coming up short due to errant passes and knock-ons. Finally around the 32nd minute Chico was able to put one down with an offload from flyhalf Jake MFV to inside center William “Kendo” Kendrick, conversion from Jake MFV was good, Chico went into half time up 7-3. The second half was much of the same as the first, Chico continued to attack the Stags defense but couldn’t put it all together for a try. Finally around the 54th minute old timer, reserve flanker Garrett Boone fresh out of retirement, crossed the line in the corner to put five more down, Jake MFV converted the difficult kick, 14-3. A badly fielded clearing kick from the Stags at the 68th minute led to a converted try and brought them back into contention, 14-10. Chico’s defense, which has been solid all year, was able to keep the newly energized Stags from taking the lead with the final score 14-10 Chico. Before the Mighty Oaks can get to Colorado and the USA Rugby National Championship they must travel to Tucson Arizona and win back to back matches, Saturday and Sunday. First up the Mighty Oaks will square off against San Marcos Greys out of Texas. Early reports say the team is big, fast and hit hard. Coach John Fox says “We will not be putting any special game plan in place. These next weeks practices will be focusing on getting healed and eliminating the simple foolish mistakes…”. If they win that match they’ll play on Sunday against the winner of Orange County Ravens and St. Louis Royals. The second match will be on Sunday May 21st at either 11:00am MST if they win or 9:00am MST.